Bringing a Caregiver into your loved one’s life can be nerve racking for everyone involved in this life changing decision. Beyond your loved one’s concerns, you will also be flooded with a whole range of emotions and questions. Is this the right decision? Will my loved one be upset with the decision? Can I trust the Caregiver to improve my loved one’s life and respect their home? You will be relieved to know that we did not become Toluca Lake’s most sought after home care agency if we did not rise to the challenge time after time and did not provide our clients and their families with the peace of mind they deserve. Aging safely and happily at home allows elderly individuals to hold onto their independence while receiving the non-medical professional care they need. 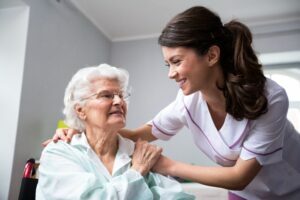 Offering a wide variety of services such as meal preparation, light housekeeping and companionship, 24 Hour Home Care has been providing top-notch care and quality customer service in the Toluca lake area for the past several years. Each potential client receives a in-home consultation free of charge. After the evaluation, our Care experts will collaborate with you and your loved one in order to create a fully customized senior home care package that caters to your loved one’s health situation, preferences, and personality. Our phenomenal customer service, passion for innovation, and integration of emerging technologies has allowed 24 Hour Home Care to create a class of in-home care that is unmatched by other home care agencies. Please do not wait and call (818) 385-0227 to discuss your loved one’s situation with an associate at our Encino office today!